Make the perfect party dress with this simple tutorial. You can make it maternity-friendly or not! I don’t get to go to a lot of fancy parties…but when I do, I’m always scrambling last minute to find something dressy, flattering and not too skanky to wear! If you’re panicking about New Year’s Eve (tomorrow! ), it’s not too late to whip up the perfect party dress. This sequined number is super easy and can be made to cover as much or as little as you want! As you can see, I don’t mind covering a 7 month pregnant belly in sequins thereby resembling a giant disco ball, …but obviously this dress can also be made more fitted for a non-maternity version. Read on for the full tutorial! Be sure to only sew with the backside of your fabric touching the machine! I.e. right sides together or topstitching. If you try to sew on the backside of your fabric with the sequins facing down, your sequins will get stuck in the little hole under your presser foot and mess up your stitching. You’ll also want to make sure you don’t use your best sewing scissors to cut this stuff out…the sequins will make them dull. 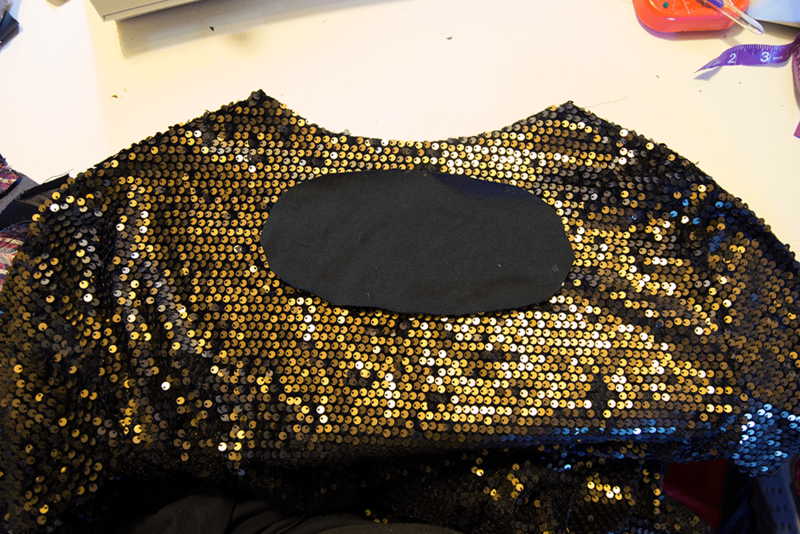 Also be prepared to do some cleanup after cutting as chopped up little sequins make a big mess! First, grab a ready-to-wear dress you own with a similar amount of stretch as your sequined fabric. Fold the dress in half lengthwise and tuck the sleeves underneath. Lay this on top of your folded sequined fabric with the folds lined up (making sure the stretch of your fabric is running horizontally to stretch around your body, not vertically!). Cut around your RTW dress, making sure you leave a seam allowance. Repeat a second time. Note: I always cut out both sides with a high neckline and then trim down the front or back as desired later. Next, sew together the front and back of your dress along the shoulder seams and the side seams. Lay your RTW dress out with sleeves exposed and cut matching sleeves out of your sequined fabric just like you did the front and back (don’t forget the seam allowances!). Sew your sleeve along the underarm seam, right sides together. Repeat with second sleeve. With dress inside out and sleeve right sides out, insert sleeve into dress and pin sleeve to dress around armscye (armhole), matching up side and underarm seams. Stitch sleeve to dress, stretching to fit if necessary. Repeat with second sleeve. Try on your dress and make adjustments to side seams as necessary; cut down the curve on your front neckline a few inches as desired. For the back cut out, cut out an oval shape out of your coodinating stretch fabric for a facing. Mine measured about 8″w x 4″h. Lay it on top of the back of your dress (right side) and position it where desired. Pin in place and stitch to dress using a very wide seam allowance (1/2 – 3/4″) (make sure you don’t catch the front of dress underneath!). Now cut through both fabrics on the INSIDE of the stitching line, all the way around the oval. Trim the facing close to stitching line. For the neckline, first measure your dress neckline. Cut out a strip of facing (out of your coordinating fabric) measuring 2 inches shorter than your neckline measurement and 1″ wide. Sew the strip together along the short ends to create a loop. Pin neckband to RIGHT side of dress neckline in 4 places: the center of your back, front and both sides of neckline. Stitch neckband to neckline, stetching band as necessary. Fold neckband to inside of dress, topstitch in place and trim excess facing, as you did for your back cut out. You have a few options for hemming sleeves and hem. You can simply fold the edges under and hem as usual, but most sequined fabrics are too itchy to have the sequins right up against your skin. If this is the case you can either leave them unhemmed (this is what I did since knit fabrics won’t fray!) or you can use a facing just as you did on the neckline. The only difference is that you’ll want to make your facing only slightly shorter/narrower than your sleeve and dress openings, rather than a full 2″ like you did with the neckline. My Fashion Faves on sale! I don’t know any other 7-month pregnant woman who could make a sequin dress look as amazing as you do! Love this tutorial and I adore your shoes! Happy New Years!